APPSC Group 3 Hall Tickets 2017 - Download AP Panchayat Secretary Screening Test Hall tickets @ psc.ap.gov.in: Andhra Pradesh Public Service Commission (APPSC) to be released a notification for 1055 Panchayat Secretary Posts. Interested and eligible candidates were sent online applications for APPSC Panchayat secretary posts. The APPSC was conducted the Group 3 Panchyat Secretary exam on 23rd April 2017. Hence, all the applied candidates for APPSC Panchayat secretary posts were appeared for the examination. The APPSC has informed that the APPSC Group 3 Panchayat Secretary hall tickets 2017 to be accessible to download from July 1st week 2017. So, the candidates, who are attempting the AP Group 3 main examination, they must download and preserve their hall tickets to show it in the examination hall. Without showing the admit card candidates will not be sent to attempt the examination. Candidates can notice the details of APPSC Group 3 exam date, time and venue details printed on it. Candidates are informed to be at the examination centre before 30 minutes of the examination. The hall tickets will be available to download from the PSC AP Official website: psc.ap.gov.in. Candidates appearing the APPSC Group 3 examination can check the hall ticket downloading process. APPSC Press note: APPSC Group 3 Panchayat Secretaries Recruitment Main Exam date postponed 2017/ APPSC Group-III Panchayat Secretary Exam Postponed Notification - APPSC PRESS NOTE: After considering all the aspects, the Commission has decided to postpone the Main examination for Group-II Services, 2016 (Notification No.18/2016) to 15th & 16th July 2017. As a result, the Main examination for recruitment to the post of Panchayat Secretary (Notification No.29/2016) would be postponed to 30th July 2017. Candidates may note the change..
APPSC Press Note: APPSC to be released a Press Note regarding Downloading of Hall Tickets for Main Exam to the post of Panchayat Secretary: It is here by informed that the Hall Tickets for MAIN EXAMINATION to the post of Panchayat Secretary Grade-IV (Notification No: 29/2016) Scheduled to be held on 30-07-2017 FN will be available in Commissions Website. www.psc.ap.gov.in or http://appscapplications17.apspsc.gov.in from July. The candidates are therefore informed to download their Hall Tickets. Note: OTPR ID is not mandatory. If a Candidate has a Valid Candidate ID generated when application is submitted, he would be allowed for downloading hall ticket. OTPR would be created for those candidates by appsc in due course. ~ Enter your roll number and given name accurately. ~ Then admit card appeared on the screen. ~ Save the APPSC Panchayat Secretary hall ticket 2017 PDF file for further use. 1. The candidate shall appear in the examination with only one hall ticket. Downloading of more than one hall ticket (where details are different) is not permitted. 2. While coming to the Examination hall, please bring your Hall ticket, smooth writing Pad, Ball pen (Blue/Black). Invigilator in the examination hall, failing which you will not be admitted to the examination. 4. The hall ticket must be presented for verification along with atleast one original valid identification card i.e., Passport, Pan Card, Voter ID, Aadhar Card, Govt., Employee ID or Driving License..etc,. 5. Please check the Answer sheets and read the instructions on it as well as on test booklet carefully. You should use blue or black ball point pen only to write your Hall ticket number, Name, Subject and Centre at appropriate places only. Writing with ink/gel pen or any other writing device at wrong places will lead to invalidation of your Answer sheet. You should use either blue or black ball pen only to encode your Hall Ticket, Paper Code and Test Booklet series (A or B or C or D) at appropriate places in the answer sheet. Failure to encode/wrong encoding will lead to invalidation of answer sheet. No correspondence would be entertained later on this point. 6. You should put your signature and get the signature of the invigilator at the appropriate places in the Answer sheet. 7. OMR sheets supplied to the candidates consist of two copies, the original copy and a duplicate copy below. After completion of the examination, candidates should handover the original OMR answer sheet (top sheet) to the invigilator and carry the bottom sheet (duplicate) for his/her record. 8. You should not mark answer choices on the Test Booklet (Question paper) under any circumstances. 9. On the OMR sheets you have to bubble using either blue or black ball point pen only. Bubbling by Pencil/Ink pen/Gel pen or any other writing device is not permitted in the examination and such answer sheet would be invalidated. 10. Under no circumstances the candidate should take away the main answer sheet and if he/she does so he/she will be disqualified. 11. Use of whitener or any other marker on OMR sheet will lead to disqualification. Possession of whitener or any other marker other than ball point pen in the examination hall will lead to disqualification of your candidature. 12. Candidates are allowed inside the test centre from 9:00 AM onwards. The test centre gate will be closed at 9:45 AM. No candidate will be allowed after 9:45 AM into the centre because filling of details in answer sheet takes time and also inconvenience would be caused to others after start of examination. Candidates are advised to check the location of examination centre in advance and also reach the examination centre early to avoid last minute rush. 13. Candidates will be permitted to appear for the Test, only after their credentials are verified by centre officials and after frisking to ensure that no prohibited articles are carried. 14. Candidates are not allowed to bring any Electronic devices such as Mobile/ Cell phones, calculators, Tablets, I­Pad, Bluetooth, Pagers or any other device capable of interacting/programming to the examination Centre. Any violation of the above leads to disqualification of candidature. 16. The total duration of the examination is 150 minutes. The paper will be in English with Telugu translation. The English version will be considered as authentic for valuation purpose. 17. NEGATIVE MARKS: As per G.O.Ms. No. 235, Finance (HR­I, Plg & Policy) Dept., Dt. 06/12/2016, for each wrong answer will be penalized with 1/3rd of the marks prescribed for the question. 18. No candidate will be permitted to leave the examination hall till the expiry of full time. 19. Admission to the examination is provisional subject to the confirmation/satisfaction of conditions laid down in Notification No.29/2016 and also subject to satisfying the eligibility criteria and verification of required certificates at a later stage. Admission / Appearing to the Examination does not confer ipso facto right for recruitment / selection. 20. Candidates are prohibited from communicating, consulting or conversing with other candidates in the Examination hall or causing disturbance in any manner whatsoever. Candidates are prohibited to borrow any item from other candidates in the Exam ­Hall in case of any disturbance, such candidates would be disqualified. 21. Violation of any of the instructions may lead to invalidation of Answer Sheet besides penal action. Rules of punishment are governed by Regulation PME notified vide G.O.Ms.No.385, GAD (Ser­A) Dept., Dt:18/10/2016 with regard to Malpractice / Misbehavior in the examinations conducted by the APPSC. For details candidates shall refer to the G.O available on website of APPSC. 22. Only those candidates, who are totally blind and who do not have both the upper limbs in the category of orthopedically disabled will be provided with the scribe at the written examination. A Candidate is also allowed to bring his own scribe as per Office Memo F.No 16­110/2003­DD.III, Government of India ­ Ministry of Social Justice and Empowerment, Department of Disability Affairs, Dated : 26/02/2013 after prior intimation to the Commission. In such cases scribe shall carry identity proof. Candidates who are blind will get extra time of 20 minutes per hour and but no extra time is allowed to such candidates who did not have both the upper limbs in the category of orthopedically disabled. An extra time of 20 minutes per hour is also permitted for the candidates with Loco motors Disability and Cerebral palsy (minimum of 40% impairment). No Scribe is allowed for such candidates. to X to the examination hall but keep them ready for production at a later date. 24. ANY VIOLATION OF THE ABOVE INSTRUCTIONS SHALL ENTAIL DISCIPLINARY ACTION ON THE CANDIDATE WHICH MAY INCLUDE DEBARMENT FROM APPEARING ANY OF FUTURE TESTS OF APPSC AND OTHER PUBLIC SERVICE COMMISSIONS IN THE COUNTRY. 25. For any further clarification please read the Notification No.29/2016 available at http://www.psc.ap.gov.in. 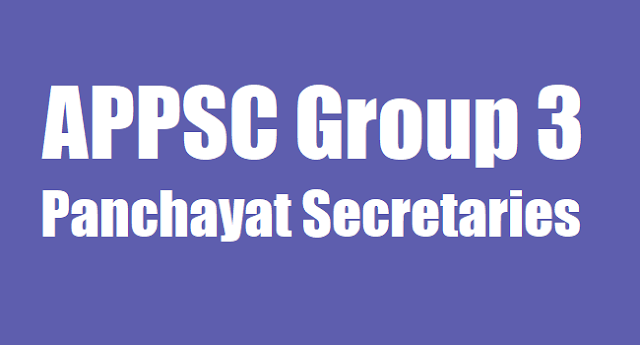 APPSC Group 3 Panchayat Secretaries Screening Test Results to be announced on May 12. Andhra Pradesh Public Service Commission (APPSC) released the 1055 Panchayat Secretary Posts recruitment notification. The APPSC was conducted the Group 3 Panchyat Secretary exam on 23rd April 2017. The applied candidates for APPSC Panchayat secretary posts were appeared for the examination. The APPSC has informed that the APPSC Group 3 Panchayat Secretary Screening test results 2017 to be released on May 12. The results will be available to download from the PSC AP Official website: psc.ap.gov.in. Candidates appearing the APPSC Group 3 main examination can check the results downloading process. ~ Then Results to be appeared on the screen. ~ Download the APPSC Panchayat Secretary Results 2017 PDF file for further use. Andhra Pradesh Public Service Commission (APPSC) has declared the Group 3 Services recruitment of Panchayat Secretary (Grade-IV) in the official website. The results can be access through entering the hall ticket number in the given space in the official website. Corrigendum to summery Result dated 12/05/2017: "Submit to declaration of result on 12/05/2017, it was noticed that there is minor error in data mapping of final examination centre. This error is rectified now and a revised summary result for pickup from screening test to main examination is prepared and the correct position is displayed below. All candidates can check their qualifying status in the revised list through the screen already provided", said a statement from APPSC. Also, APPSC said, the result in their individual cases is sent to all candidates through SMS& E-mail. In Case any candidate forgot his/her Hall Ticket No., he/she may sent a letter in hosting to APPSC and after verification of credentials, the information would be provided on the registered Email and Mobile numbers. The summery Report result of screening test for Panchayat Secretary is as below. Notification No:29/2016 - Panchayat Secretary (Grade - IV) in A.P. Panchayat Raj Subordinate Service screening Test results: In total 52,750 Candidates are selected from different Districts to determine the eligibility of candidates amongst candidates having equal last mark, the older person in age is selected. Each candidate can view his results by clicking the link on psc.ap.gov.in and feeding his/her Regd.No (HT.No) through OTP sent to his/her registered E-Mail/Mobile Number. The facility to view result would be available within few hours from now. The Result will also be sent by APPSC to all registered E-Mail/Mobile Numbers of candidates who appeared in the examination.